On April 22 each year, people come together to pick up trash at their local parks, plant a tree, or take a pledge to commute to work by biking or walking. It's all done as an effort to "go green" and celebrate Earth Day. This Earth Day, you can do more than just “reduce, reuse, and recycle.” You should be doing that every day anyway, right? Take the extra step to help reduce air, land, and ocean pollution, support your local recycling program, or donate to a worldwide or national cause. 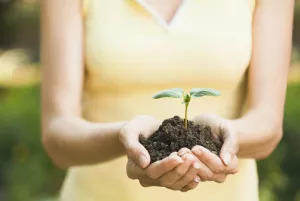 You can certainly plant a tree, but it might be easier to start out with the basics, like an herb garden or a few vegetables. First, get some must-have garden essentials, like compression gloves and a knee saver accessory. Planting your own little garden can help ensure your vegetables are pesticide-free and it may help save on your monthly food costs. This year's Earth Day fell on the perfect day for this one. Mondays often go by the term Meatless Monday, and offer the perfect opportunity to make a purely veggie-friendly dish. Swap in steamed veggies in your pasta or use a veggie burger instead of a beef patty. In general, a vegetarian diet is thought to be healthier for the planet than eating meat, although some say factory farming is the problem, not meat in general. Do you love the ocean? Enjoy picnicking in the park? Choose your favorite outdoor activity and make a donation towards a cause to preserve that wildlife. For more information about wildlife causes, check out the Natural Resources Defense Council. The list of acceptable recyclables is constantly changing. Things are continuously being added and some recycling programs differ from city to city. Waste Management has an informative guide to what can be recycled and how to go about recycling them, but also look to your local city’s website for area-specific details. It’s time for your annual spring-cleaning bout, so why not take a little extra time to donate your lightly used items to someone in need. Go through your shoe closet (think: old fitness shoes), children’s toys, book shelves, dressers, or garage and instead of throwing unused items away, donate them to the local Salvation Army or bring them to the nearest donation bin.